Much more than clinical knowledge is needed to successfully manage chronic pain and treatment regimens that include opioids. SPARC (Safety, Prevention, Awareness, & Raising Confidence) includes didactic presentations by experienced provider-educators on specific topics of interest and in-depth, case-based, and interactive discussions from the community providers’ practices. Feedback and practical recommendations will be provided. Sessions begin Wednesday, March 6, 2019 and will run twice a month from 12:30 pm - 1:20 pm via Zoom. .75 AMA PRA Category 1 Credit available. 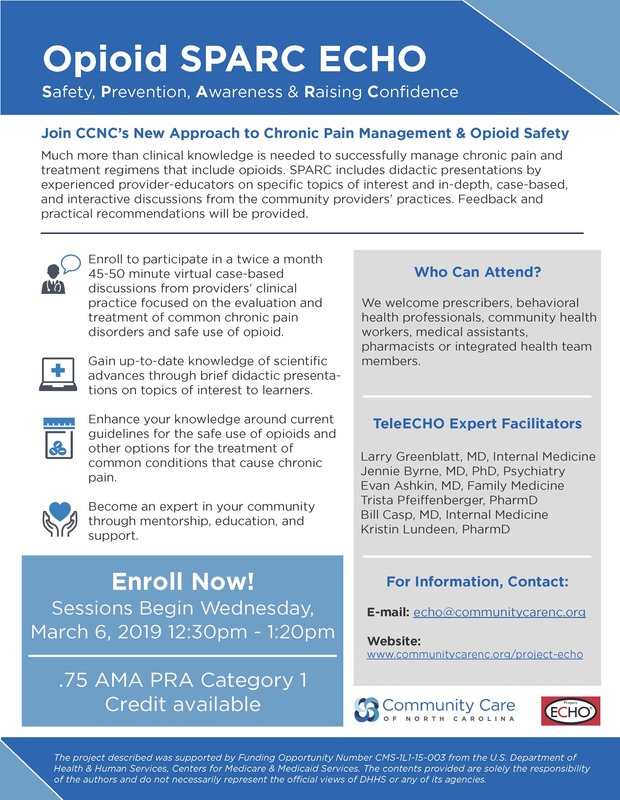 Gain up-to-date knowledge of scientific advances through brief didactic presentations, enhance your knowledge around current guidelines for the safe use of opioids, and become an expert in your community through mentorship, education, and support. Please reach out to echo@communitycarenc.org if you have any questions. March 20, 2019 - Awareness: Using CSRS like a Pro! Dr. Byrne is a board-certified adult psychiatrist. In addition to her work at CCNC as Deputy Chief Medical Officer, she has owned a group psychiatry practice in Chapel Hill for 9 years. She is active with the North Carolina Psychiatric Association and will be the incoming President in May 2019. Dr. Byrne has been a MAT provider in her community since 2010 and brings expertise about the management of opioid use disorders with co-morbid psychiatric issues. A area of interest is the treatment of adult ADHD in patients on MAT with substance use disorders. Andrew serves as the VP of Clinical Integration in CCNC's recently aligned Population Health Solutions unit, leading both Care Management and Clinical Programs/Integrated Health. Andrew joined CCNC in 2016 as the Director of Behavioral Health and was previously the Director of Integrated Health at Community Care of the Sandhills where he led quality improvement, pediatrics, maternal health, and behavioral health programs. Andrew has been a staunch advocate for integrated health care and has led the development of innovative programs. Dr. Ashkin is a Professor of Family Medicine at UNC Chapel Hill and has been providing primary care and hospital care in a variety of clinical settings for over 25 years, including Federally Qualified Health Centers. He founded the UNC Family Medicine Underserved Residency Track and the North Carolina Formerly Incarcerated Transition (FIT) Program. Dr. Ashkin has taught medical students and residents how to care for patients with chronic pain throughout his career and serves as a resource for his colleagues and community partners. Trista serves as Director of Network Pharmacy Programs for CCNC. She is also the project coordinator for an award from the Centers for Medicare and Medicaid Innovation focused on connecting community-based pharmacy to the medical neighborhood. Prior to joining CCNC, Trista held pharmacy leadership positions at both Duke University Hospital and UNC Hospitals. Trista’s impact to health care has been recognized recently when she was honored by the North Carolina Association of Pharmacists with the Don Blanton and by Triangle Business Journal as a “Health Care Hero”. Dr. Greenblatt is a Professor of Medicine in the Department of Community and Family Medicine at Duke University School of Medicine with nearly 25 years’ experience as an outpatient internal medicine physician at Duke Outpatient Clinic. He has served as the physician champion of Duke’s opioid safety program since its start in 2013 and serves as Medical Director of Northern Piedmont Community Care. He has taught about safe opioid prescribing to many audiences at Duke, at regional and national meetings, and at many community hospitals. Dr. Casp earned his medical degree at the University of Pittsburgh and stayed there for his residency, where he served as a chief resident. After a year working in an ER, he moved to western NC to practice internal medicine, with a special interest in cardiology. While practicing medicine, he began working for CCNC as Medical Director for 2 counties. It was there through committees that he began studying the opioid problem. In the last year, he has attended the UNC ECHO opioid program weekly sessions. He believes the opioid problem is a national health emergency. Kristin Lundeen, PharmD, serves as the Director of Pharmacy on the Clinical Integration team within Community Care of North Carolina’s Population Health Solutions Department. Prior to joining the CCNC team in Raleigh in 2017, Kristin served as the lead Network Pharmacist for AccessCare, one of CCNC’s regional networks. Kristin has served as a preceptor for pharmacy students and residents through the UNC Eshelman School of Pharmacy, with a focus on integration of pharmacy services across all settings of the medical neighborhood.